Embroiderers' Association of Canada, Inc.: Chainsaws, Balls and a Spectacular Day! Yesterday I attended a lecture entitled, “Truro’s Most Spectacular Day”, and it got me thinking of the spectacular days that have made up my life – mostly days that have included members of my family. One of those days happened on Saturday, March 8, 2014. A few days earlier, our son and I were having a phone conversation as he was heading off to work and he told me that he was going to try to break one of the Guinness World Juggling Records. ﻿I suppose that we, his parents, are to blame for his interest in juggling; one Christmas many, many years ago we gave him “The Klutz Book of Juggling” complete with three juggling balls. 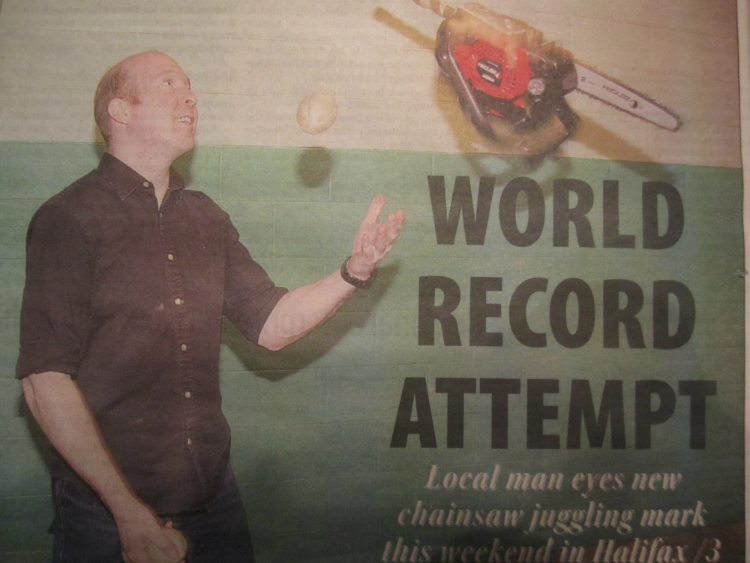 Over the years we have been treated to juggling shows with balls, clubs, fire, and knives; in 2011, he demonstrated his juggling skills with 3 running chainsaws and now holds the present Guinness World Record. And now he was preparing to try to break the previous Guinness World record for juggling a running chainsaw and two balls for more than 114 throws. He would be performing at the Annual Atlantic Outdoor Sports and RV Show in Halifax, Nova Scotia where he was booked to do 5 shows in three days. He was coming off a very busy work week coupled with a LOT of media attention for the upcoming shows and we knew that he would have to expend a great deal of energy to throw the 3.4 kg chainsaw in the juggling routine. It would have been wonderful to be two of the more than 20,000 people who passed through the gates but things did not work out for us to be there. Instead, we kept our eyes glued to Facebook and our ears open when the newscasts were shown. We knew that it would take only one slip as he balanced on a board placed on a cylinder juggling knives, or a miscalculation when he put the blazing fire torch in his mouth, to put an end to his efforts. 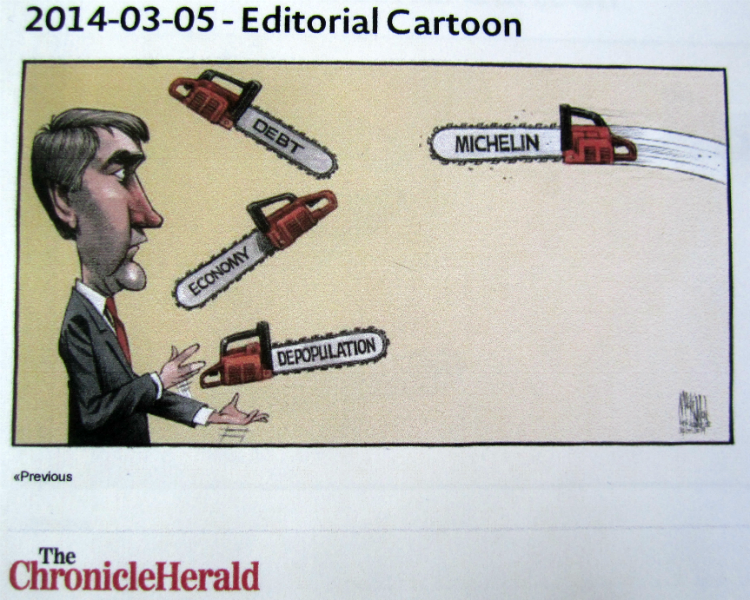 And there was always the chance that a throw of the chainsaws when he juggled the three would not go as planned. Believe me, it is much easier to imagine all the things that can go wrong when you are waiting at home! At last a “Congratulations!” appeared on Facebook and we knew that he had broken the record. 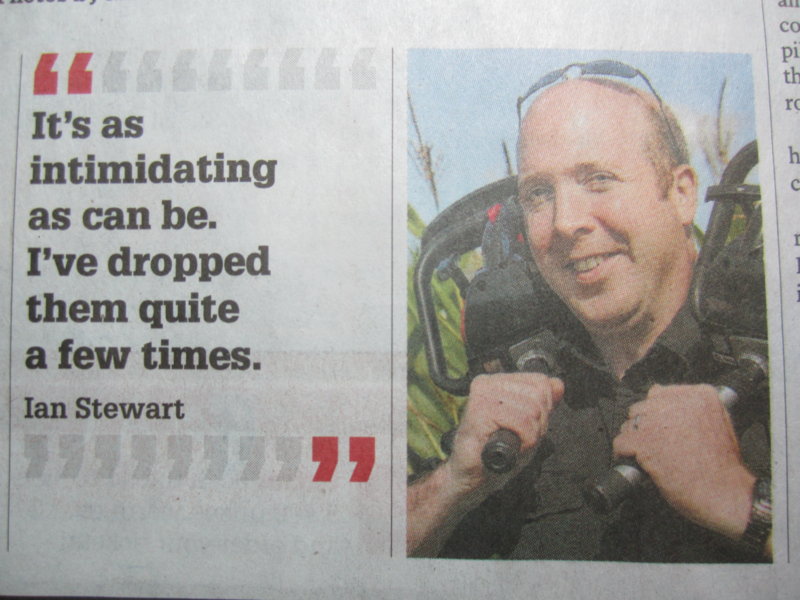 Then both CBC and CTV Evening news had clips of him setting the new record – 157 throws and catches! He actually broke the previous record at all five shows but the three Saturday shows were the most challenging since people from Discovery Channel’s “Daily Planet” were filming his efforts. It was not until I saw their show the following week that I realized just how exacting a science juggling is, how much of a body workout our son gets each time he juggles, and the amazing skill that he has perfected. Yes, I am one proud Mom who was recently treated to a most spectacular day! So Very Glad you shared this with everyone Sheila... I was thinking of you when this was covered in the news, and while watching 'Daily Planet'.. Did you Ever imagine where that little book would take him so many years ago?! and.. that you would survive the suspense of it all! .. and Loved that cartoon ..
Sheila - I watched your son break the record on Daily Planet - way to go! Congratulations to him on his achievement! I think it shows how creative the children of creative people often are, although in a different way sometimes. Awesome feat!